Well, no, not really, of course not. It’s just — two consecutive posts, on two consecutive days?! The sky falling in is more likely than that! 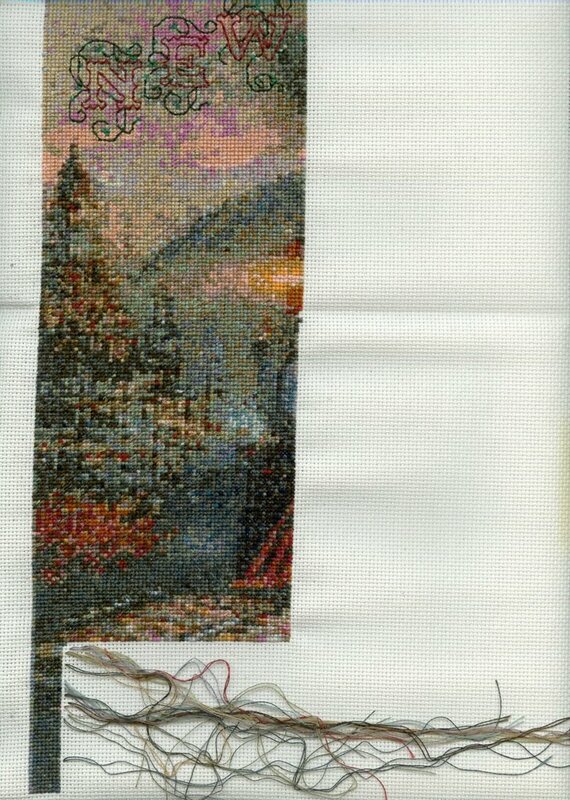 But I wanted to respond to the several positive comments I got about my cross stitch. 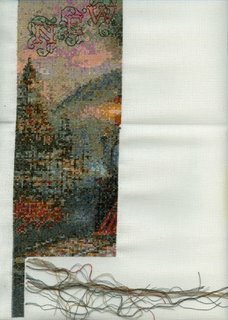 It is a complicated pattern, but made much simpler by two nifty little tricks I learned from a cross-stitch group I joined online: parking threads, and gridding. Now, it will occur to you that the last little tongue on the piece I put up yesterday looks like a heck of a lot more than a 10 x 10 grid. That’s because I was down to the last 40 rows, and decided to work that bit straight down to the end, just to make sure I wasn’t going to run out of room at the end — yes, I had checked and double-checked innumerable times, but “paranoia strikes deep, into your life it will creep” (OK, Blast from the Past out of my system now). I had to be sure. Now that I am sure, I’ve gone back to a regular 10 x 10 grid. And once this page is done, my pattern will be 20% complete. The next part takes me back up to the sky, and to stitching the word “Hope” in the sky — the idea is to have “New Hope and Ivyland” arcing across the sky, and the word “Railroad” appearing in a straight line beneath those words. It’s a present for my son, who has seen it, and, for an almost-27-year-old bachelor male, is quite excited about it! Now that I have that out of my system — someone whose blog I subscribe to was bemoaning her slacker status, and promising a whole bunch of us to respond to our posts. I told her, No problem, and besides, there’s a nasty little flu bug making the rounds of these he-ah pahts, which I know because it bit me yesterday and I’m still recovering (nicely, thank you). It’s pretty sad when a little old flu bug can thumb its nose at flu shots and leave you shivering under a pile of blankets while burning up with fever, and every muscle feeling as if it’s just been under the rack. My point to her was that slacking is *good,* if it means you’re getting lots of sleep, because sleep is necessary to keep up one’s immune system so these nasty little bugs don’t find their way in the back door. Can I make up excuses for slacking, or WHAT? Dang, I’m good. Last week was my 37th wedding anniversary. We have survived travel 1/4 of the way round the world and back, seven moves, two children, in-laws (by far the hardest part), my changing religions — twice — the ins and outs of the public-school system, which I thank God I will never have to deal with again, AND the federal government, which is what has put bread and water on our table for all of these 37 years. I’m at an age where I hope I’ll see my 38th wedding anniversary, but at least, that’s not because I fear divorce; I’m just at That Age. I see people younger than me in the Obit columns all the time. And since I’m rather fond of the person with whom I have shared more than half my life, I’d like to continue sharing my life with him awhile longer.